While many people in Haiti wish thay had clean and fresh running water in their homes, in many parts of the country, that water goes to waste when they do get it. Because the water pressure is so low, a water basin is constructed to catch the water when it comes. The problem with this formula is that water gets wasted, ONE because it gets dirty quickly. Also if there is no one there to close shut it down, that clean fresh water flows out of the little basin into the streets all day long. There are no water meters in Haiti, you don't pay per gallon like in the United States. So there is no need to keep track of how much water flows through the faucet. Many people don't care if the excess water goes to waste. Is this happening in your neighborhood in Haiti? 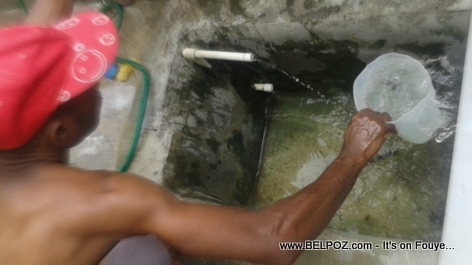 Bien que de nombreuses personnes en Haïti souhaitent avoir de l'eau courante propre et fraîche dans leurs maisons, dans de nombreuses régions du pays, l'eau se gaspille quand elles l'obtiennent. Parce que la pression de l'eau est si faible, un bassin d'eau est construit pour attraper l'eau quand il arrive.